Did you know that most B.C. highways require passenger vehicles to use winter tires between October 1 and March 31? The "Designated Winter Tire and Chain-Up Routes" maps, show the few sections of highways that do not require winter tires or chains during winter. 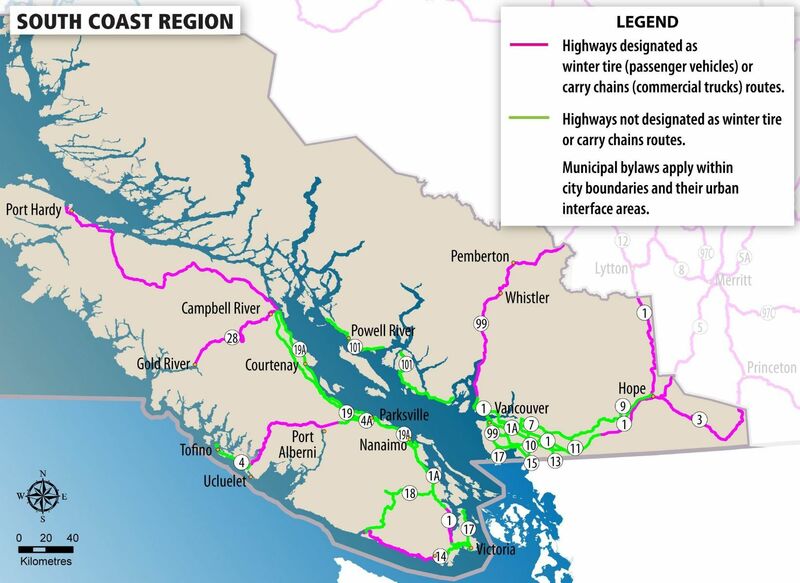 These include Greater Vancouver and Greater Victoria areas. 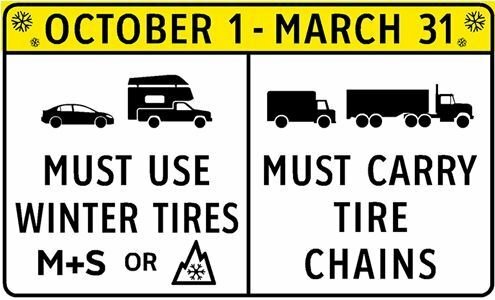 However, the SEA TO SKY HIGHWAY, CROWS NEST, COQUIHALLA AND HIGHWAY 1 EAST OF CHILLIWACK all require winter tires from OCTOBER 1st through MARCH 31st. ALL interior and northern BC highways require winter tires as well. What's the minimum legal requirement on provincial highways that require winter tires? Acceptable winter tires are marked by either the mountain/snowflake logo or a variation on the M+S (mud and snow) logo. The tires must have no less than 3.5 mm of tread. How exactly do winter tires differ from all-season and summer tires? Tire performance is directly related to temperature. As a tire heats up, its rubber softens and its grip increases. This is the reason you see racecars swerving this way and that before the green flag drops – they’re increasing tire temperature so as to increase traction. Summer tires are made of hard rubber that softens under warm summer driving conditions. Under cold conditions (defined as anything below 7 degrees Celsius), the opposite happens – the rubber becomes even harder, much like hockey puck on the ice. The consequence of hardened rubber is significantly less traction and poorer braking performance under cold temperature conditions. Winter tires, on the other hand, have a tread pattern and composition of soft rubber specifically designed to optimize traction and braking performance in cold temperatures. And they really work. In fact, braking performance in cold weather is up to 62% better with winter tires than with all-season tires. Speaking of all-season tires, some people believe they’re the best of both worlds, optimized to perform under both warm and cold temperatures. In theory, this is true. In the real world, however, they’re the worst of both worlds. They perform poorly in warm temperatures compared to summer tires, and they perform poorly in cold temperatures compared to winter tires. It is easy to see that the safest option is to run two sets of tires: summer tires for warm weather and winter tires for cold weather. Despite the supporting evidence, there are two reasons why people don’t necessarily do this: cost and storage. But this is untrue! The money spent on a set of winter tires is the money saved on the lack of wear on the summer tires –10,000 km on winter tires means 10,000 extra km on your summer tires! And regarding storage, Clarkdale’s Tire Storage Program has got you covered! Finally, although it is not required if you are driving on winter tires, it is a good idea to carry chains for extreme weather. As automotive professionals we have an obligation to let all our customers know of these regulations. Someone without winter tires on their vehicle may be prevented from driving on highways requiring them, and in a worst case scenario, may be held criminally negligent should an accident occur while driving on these roads without winter tires. If you have any questions, feel free to give us a call at (604) 872-5431. We’re here to help. If you wish to purchase your winter tires at Clarkdale Volkswagen, we’re currently offering special winter tire + wheel packages.